This picture contains a visual celebration of Shabbat and a hidden creation sequence. The Shabbat candlestick holders may be seen three different ways. 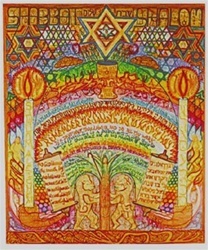 Viewing them one way, they are shofars; a second way they are hands; and a third way as people greeting the Shabbat angels of peace just above them. The two loaves of challah bread, composed of people, represent these loaves as the "bread of life." The piece also contains a day-by-day creation sequence hidden within its design. 12.5" x 15.25". Limited Edition lithograph, artist numbered and signed.